SoCal Petals strives to be the floral industry's leader in high-quality, custom-designed cut-flower arrangements throughout the US. SoCal Petals, a division of Peachtree Petals is the new leading West Los Angeles florist, specializing in premium floral arrangements and assorted gift services. SoCal Petals strives to be the floral industry's leader in high-quality, custom-designed cut-flower arrangements throughout the US. The announcement comes in an effort to market its line of custom floral arrangements specific to California customers, expanding its client market and increasing online exposure to its new gift shop location. The West Los Angeles Originals Collection is available within the "Flowers" page of its comprehensive website. The stunning collection is filled with all of the culture and style that make up the essence of Los Angeles, as well as California. With over 25 years of combined floral experience, its professional designers have created its very own original, one-of-a-kind floral arrangements only available with SoCal Petals. The collection is comprised of a wide variety of custom-designed floral arrangements for customers to enjoy. The California Magnolia Bouquet is a wonderful, premium arrangement that captures the smell of the magnolia air in Los Angeles that residents have come to love. This arrangement displays a contrasting colorful beauty with purple hydrangea and cream roses which combine to mimic the intoxicating smell of magnolia. This bouquet is available for only $109.95. SoCal Petals also provides customers its signature same-day and next-day flower delivery services. SoCal Petals offers same-day delivery for only $13.99 and next-day delivery for $11.99. For questions regarding its West Los Angeles Originals Floral Collection or any other custom arrangements, please contact SoCalPetals to discuss any same-day floral needs. Peachtree Petals is a well-known leader of superior floral arrangements and a recognized Master Florist nationwide. 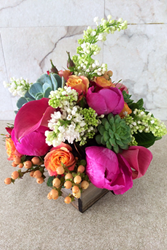 For the best flowers in Los Angeles, SoCal Petals is able to meet all of your floral an assorted gift needs. It services a growing list of clients, including company floral subscriptions and weekly floral services. The company offers a simple approach to the floral industry, most notably, same-day delivery of all their floral arrangements in the Atlanta and West Los Angeles areas.